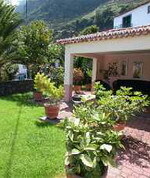 Quaint annexe to traditional Portuguese town-house in the tranquil village setting of Sao Luis, close to the sea-side resort of Vila Nova De Milfontes (15 mins drive). All amenities available within village just a short stroll into centre: bars, restaurants, bank with ATM, post-office, market/supermarkets, bakery etc. Spacious twin double bedroom furnished in sympathetic style with locally-sourced wooden beds and furniture plus two, double built-in wardrobes. Tea/coffee making facilities and armchair. Large en-suite with separate corner shower unit, built-in marble-topped vanity sink, wc, and shelving. Large sunterrace with panoramic views to the Serra De Cercal and the natural parque. Breakfast as required from typical English to continental. Evening meals/barbecues are available at very reasonable prices. We welcome you to the majestic north coast of Madeira, where the mountains fall into the surfed sea. This is the place to relax and for mountain hikes. 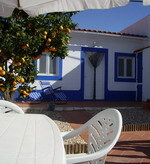 Casa das Videiras lies in the picturesque village of Seixal, 100 meters from the sea, 500 meters from the natural pools and the black sandy beach. Come and experience authentic village life, enjoy the good and reasonable restaurants next door and breath the air of times past. 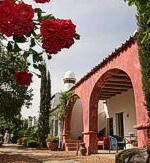 The house was built in 1867 and restored in 1995 and is charmingly decorated. The garden cottage can house one couple, and the main house 1 to 3 couples. This is the north coast where you will be able to do mountain and levada (water way) walks. You are next to the world heritage ethnic laurel forest. The sea is good for swimming, diving and do not forget fishing.